Orson Welles said The General may be the greatest American film. Citizen Kane is number one on the AFI list, so if Welles thinks The General is better what should we make of that? I’ll tell you what we should make of it — Welles must have been high when he said it because The General was a boring, tedious, waste of time. I actually fell asleep halfway through and when I woke up I barely missed anything. Really AFI? As I near the end of this cinematic journey it’s clear to me that lists like this (and maybe all “best of” lists) are made up faded memories, fake intellectualism and the subjectivity of art. I bet I could come up with 100 films off the top of my head that were better than half the films on this list. I’m sure you can too. But, alas, we’re not members of the American Film Institute so we are not qualified to comment on greatness. Well, I digress. 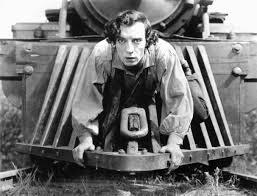 The General is a 1926 silent film starring Buster Keaton as a hapless train engineer who despite being turned down to fight for the Confederacy at the start of the Civil War manages to save the day anyway by single-handedly foiling the Union’s attempt to steal his train and cut of supplies to the southerners. And he does it by slipping, falling, failing and fumbling along the tracks. Don’t get me wrong, I like silent films and comedies in particular. I won’t argue that several silent films belong on the AFI list, and in fact several Charlie Chaplin films are on the list including City Lights which comes in at No. 11. I just thought this film was a bore.